Coeur d'Alene ( i/ˌkɔər dəˈleɪn/ KORR də-LAYN) is the largest city and county seat of Kootenai County, Idaho, United States. It is the principal city of the Coeur d'Alene Metropolitan Statistical Area. As of the 2010 census, the population of Coeur d'Alene was 44,137. The city is about 30 miles (48 km) east of the larger Spokane, Washington, of which it is a satellite. After the 2010 Census, the two metropolitan areas were merged into a single Combined Statistical Area, with a population of 679,989. Coeur d'Alene is the largest city in northern Idaho Panhandle. The city is situated on the north shore of Lake Coeur d'Alene, 25-mile (40 km) in length. Locally, Coeur d'Alene is known as the "Lake City," or simply called by its initials: "CDA". The city of Coeur d'Alene has grown significantly in recent years, in part because of a substantial increase in tourism, encouraged by several resorts in the area. Broadcaster and media figure Barbara Walters called the city "a little slice of Heaven" and included it in her list of most fascinating places to visit. On November 28, 2007, Good Morning America broadcast the city's Christmas lighting ceremony because its display is among the largest in the United States. The Coeur d'Alene Resort takes up a prominent portion of the city's downtown. It is also near two major ski resorts: Silver Mountain Resort to the east in Kellogg, and Schweitzer Mountain Ski Resort to the north in Sandpoint. The city is named after the Coeur d'Alene People, a federally recognized tribe of Native Americans who lived along the rivers and lakes of the region, in a territory of 3.5 million acres extending into Washington and Montana. They were first encountered by French fur traders in the late 18th and early 19th century, who referred to them as Cœur d'Alène, meaning "heart of an awl," reflecting their experience of the tribal traders as tough businessmen, "sharp-hearted" or "shrewd". The Coeur d'Alene people called themselves by the autonym Schitsu'umsh in Coeur d'Alene, one of the Salishan languages, meaning "The Discovered People" or "Those Who Are Found Here." This area was extensively explored by David Thompson of the North West Company starting in 1807. The Oregon boundary dispute (or Oregon question) arose as a result of competing British and American claims to the Pacific Northwest of North America in the first half of the 19th century. The British had trading ties extending from Canada and had started settlements in present-day British Columbia and at Fort Astoria on the Pacific coast near the mouth of the Columbia River. The Oregon Treaty of 1846 ended the disputed joint occupation of the area in present-day Idaho when Britain ceded all rights to land south of the 49th parallel to the United States. When General William T. Sherman ordered a fort constructed on the lake in the 1870s, he gave it the name Fort Coeur d'Alene; hence the name of the city that grew around it. The name of the fort was later changed to Fort Sherman to honor the general. North Idaho College, a community college, now occupies the former fort site. 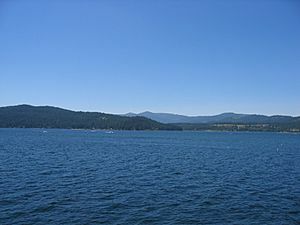 The lake was also named for the Coeur d'Alene. Miners and settlers came to the region after silver deposits were found. It became the second-largest silver mining district in the country, generating both great wealth and extensive environmental contamination and damages. In the 1890s, two significant miners' uprisings took place in the Coeur d'Alene Mining District, where the workers struggled with high risk and low pay. In 1892, the union's discovery of a labor spy in their midst, in the person of Charlie Siringo, sometime cowboy and Pinkerton agent, resulted in a strike that developed into a shooting war between miners and the company. Years later Harry Orchard, who owned a share of the Hercules Mine in the nearby mountains before it began producing, confessed to a secret, brutal and little understood role in the Colorado Labor Wars. He later confessed to dynamiting a $250,000 mill belonging to the Bunker Hill Mining Company near Wardner during another miners' uprising in 1899. He returned later to Idaho to assassinate former Idaho Governor Frank Steunenberg in 1905. Coeur d'Alene is located at (47.692845, −116.779910), at an elevation of 2,180 ft (660 m) above sea level. According to the United States Census Bureau, the city has a total area of 16.08 square miles (41.65 km2), of which, 15.57 square miles (40.33 km2) is land and 0.51 square miles (1.32 km2) is water. The wooded lands east of the city have been designated for protection and management as the Coeur d'Alene National Forest. The city is surrounded by forest, which contains several lakes and campgrounds. 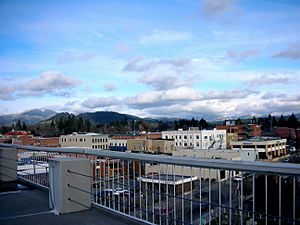 It is 30 miles (48 km) east of Spokane, Washington, and is part of a common metropolitan area. It is 311 miles (501 km) east of Seattle, Washington, on Puget Sound on the west side of the Cascade Mountains. Panorama of Coeur d'Alene from Cougar Bay. The tall building to the far right is the Coeur d'Alene Resort. 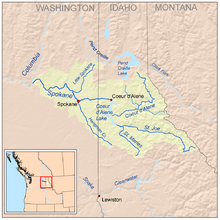 Coeur d'Alene has, depending on the definition, a dry-summer continental climate (Köppen Dsb), or a warm-summer Mediterranean climate (Csb), characterized by a cold, moist climate in winter, and very warm, dry conditions in summer. It straddles the border between USDA Plant Hardiness Zones 6B and 7A. The monthly daily mean temperature ranges from is 29.8 °F (−1.2 °C) in December to 69.0 °F (20.6 °C) in July and August. Temperatures exceed 90 °F (32 °C) on 13 days per year, only occasionally reaching 100 °F (38 °C), while conversely, there may be several nights below 10 °F (−12 °C). Snowfall averages 70 inches (178 cm) per year; precipitation is generally lowest in summer. The average first and last freeze of the season are October 12 and May 3, respectively. As of the census of 2010, there were 44,137 people, 18,395 households, and 10,813 families residing in the city. The population density was 2,834.7 inhabitants per square mile (1,094.5/km2). There were 20,219 housing units at an average density of 1,298.6 per square mile (501.4/km2). The racial makeup of the city was 93.8% White, 0.4% African American, 1.2% Native American, 0.8% Asian, 0.1% Pacific Islander, 0.9% from other races, and 2.8% from two or more races. Hispanic or Latino of any race were 4.3% of the population. There were 18,395 households of which 29.9% had children under the age of 18 living with them, 42.2% were married couples living together, 11.6% had a female householder with no husband present, 5.0% had a male householder with no wife present, and 41.2% were non-families. 31.4% of all households were made up of individuals and 12.1% had someone living alone who was 65 years of age or older. The average household size was 2.33 and the average family size was 2.92. The median age in the city was 35.4 years. 22.9% of residents were under the age of 18; 11.6% were between the ages of 18 and 24; 26.7% were from 25 to 44; 24% were from 45 to 64; and 14.6% were 65 years of age or older. The gender makeup of the city was 48.6% male and 51.4% female. Hispanic or of any race were 2.70% of the population. There were 13,985 households out of which 31.7% had children under the age of 18 living with them, 47.7% were married couples living together, 11.5% had a female householder with no husband present, and 36.7% were non-families. 28.2% of all households were made up of individuals and 11.3% had someone living alone who was 65 years of age or older. The average household size was 2.39 and the average family size was 2.93. The median age was 35 years. For every 100 females there were 93.7 males. For every 100 females age 18 and over, there were 89.3 males. The median income for a household in the city was $33,001, and the median income for a family was $39,491. Males had a median income of $31,915 versus $21,092 for females. The per capita income for the city was $17,454. About 9.3% of families and 12.8% of the population were below the poverty line, including 13.5% of those under age 18 and 8.1% of those age 65 or over. Coeur d'Alene is the home of Ironman Coeur d'Alene, which started in 2003. This Ironman Triathlon is held each year on the fourth Sunday in June. It starts at the Coeur d'Alene resort, where triathletes start the competition with a 2.4-mile (3.9 km) swim in Lake Coeur d'Alene, followed by a 112-mile (180 km) bike, finishing with a 26.2-mile (42.2 km) run. Coeur d'Alene is the site of the Christian Youth Theater (CYT) North Idaho headquarters. Annually in June, CDA hosts "Car d' Alene," where all the hot cars, both new and old, are brought out on display for admiration and bragging rights. The first weekend in August North Idaho Community College hosts Art on the Green. An arts and crafts outdoor festival sponsored by Citizens' Council for the Arts. The local college art program had a public art campaign called "Moose on the Loose," when local artists and college art students painted and decorated a dozen or so life-size moose statues with various colors and accessories. After being displayed, the pieces were auctioned off to local businesses as a fundraiser. The moose were installed on sites from downtown near Sherman Ave. to Government Way on the CdA/Hayden boundary. The moose have become both a town landmark and a popular scavenger hunt item. Coeur d'Alene and the surrounding area provide many outdoor recreational opportunities, such as: mountain biking, hiking, camping, fishing, hunting, etc. The Snake Pit Derby Dames are based here; they are an all-female flat track roller derby league. The competitive season is March–November and Bouts (matches) draw large crowds. The Coeur d'Fondo, a bike race that ranges from 15 miles to 108 miles (24–174 km), is held annually in summer. The Coeur d'Alene crossing is a swimming challenge, in which swimmers try to cross the lake. The 12th track of Alter Bridge's third album AB III is named after the city and is inspired by lead singer Myles Kennedy's spending time here as a child. Harold Covington features Coeur d'Alene repeatedly in his Northwest Trilogy historical novels as the place where the Northwest revolt began. In the book Walk Two Moons, Coeur d'Alene is a stop on the main character Salamanca Tree Hiddle's trip. The narrator in Iris DeMent's 1993 song Easy's Gettin' Harder Every Day wishes she could "run away to Coeur d'Alene." In Tom Clancy's fourth book in the Net Force series, Breaking Point , a character hides in the Aryan Nations compound (now destroyed) in Hayden Lake (referred to as Coeur d'Alene). Sam Bourne's novel The Righteous Men, refers to this city as home of the Aryan Nations. However, the Aryan Nations' home was in nearby Hayden Lake. It is since defunct, demolished after a lawsuit and the bankruptcy of the Aryan Nations. Luke Redfield's song, "Coeur d'Alene," from his 2010 album, Ephemeral Eon, depicts a simple love story in the city. Listed in Patricia Schultz's book 1,000 Places to See Before You Die. The independent film Smoke Signals, based on stories by Sherman Alexie, feature characters of the Coeur d'Alene Tribe who live on its reservation and have a quest auto trip. The film Teenage Dirtbag is set here. It was written and directed by Regina Crosby, who grew up in Coeur d'Alene. She was inspired by events from her time in high school. The film Kid Cannabis was set here. The indie folk band The Head and the Heart released a song entitled Coeur d'Alene that is included on their 2011 debut album The Head and the Heart. Coeur d'Alene, Idaho Facts for Kids. Kiddle Encyclopedia.